Griffin Technology one of the world's foremost creators of innovations for everyday life , announces its iPhone 6 case lineup that features something for everyone – from customisable cases to protective and functional. "We've been anxiously awaiting the unveiling of Apple's new iPhone 6 models along with the rest of the world," said Chris Paterson, General Manager of Design and Product Marketing at Griffin Technology. "Griffin is excited to introduce a full line of our most popular accessories for the new iPhone 6 and iPhone 6 Plus to help users enhance and protect their long-awaited technology." Leading the line-up is Griffin's family of Identity cases, which are the perfect combination of drop protection and self-expression. These cases are slimmer than rugged cases yet more protective than shells. Identity features a two-piece design that offers the best of both worlds with its protective bumper and low-profile back plate. The hybrid bumper combines shock-absorbing rubber with a hard plastic frame to protect the iPhone from 4-foot drops. A raised lip protects the front screen and edges from chips and scratches. Identity cases for iPhone 6 will be available in a variety of colors in Performance, Graphite and All Clear models. Users with two or more Identity cases can take advantage of the two-piece design by interchanging back plates and bumpers to create their own new look. Identity for iPhone 6 and iPhone 6 Plus will range from US$29.99 to $39.99. Next up is Griffin's best-selling line of Survivor cases, which are all designed to meet or exceed U.S. Department of Defense Standard 810G for shock/drop and vibration. New iPhone 6 owners can confidently protect their phone with Griffin's Survivor All-Terrain, Survivor Slim and Survivor Core models, all available in a variety of colors. 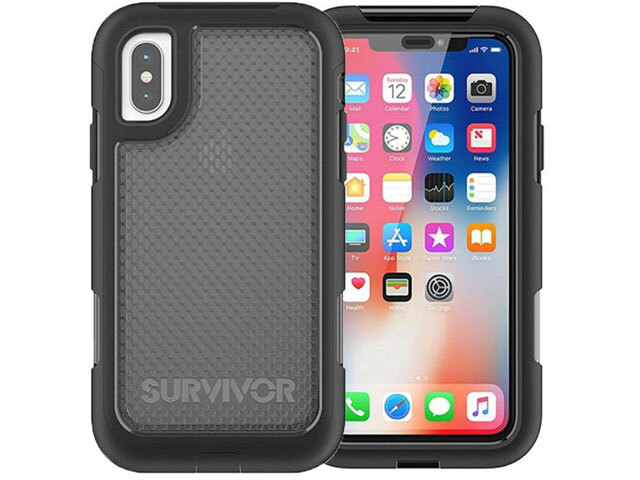 Survivor All-Terrain (US$49.99) is built with a shatter-resistant polycarbonate frame clad in rugged, shock-absorbing silicone, and protects against 2 meter drops. A built-in screen protector seals the touchscreen from extreme conditions like dust, sand, rain, shock, vibration and a host of other environmental factors. Hinged plugs seal the dock connector and headphone port when they're not in use. Survivor Slim (US$39.99) is a sleek dual-layer case that provides drop protection from 2 meters in a slimmed-down form factor. Designed with an inner polycarbonate shell jacketed in premium silicone, Survivor Slim is great for anyone looking for drop protection in a slim, light profile. Survivor Core (US$29.99) is the thinnest, lightest case that offers protection from a height of 2 meters. Survivor Core combines thin polycarbonate with extra resilient TPE rubber at the edges and corners for impact protection where it's needed most while still showing off the sleek looks of iPhone 6. Griffin will also update the industry's best-selling hard shell case, Reveal, for iPhone 6. The ultra-thin case features a sleek, one-piece design that lets the beauty of the iPhone shine through even as it shields it from dings and scratches. The thin shell protects as only polycarbonate can, yet adds only a little over a millimeter in thickness, with slim rubber edges that cushion and grip your iPhone tight. Reveal for iPhone 6 and iPhone 6 Plus will be available in a wide array of colors for US$19.99. Wallet is a streamlined case that keeps iPhone 6 and iPhone 6 Plus safe and holds ID, credit cards and cash in slots inside the cover. The cover is hinged like a book to fold back during use. The case has cutaways for ports and controls, and grips the sides of the iPhone 6 to give edge-to-edge access to the touchscreen. Wallet will be available in black for US$39.99. Griffin's new case collections for iPhone 6 and iPhone 6 Plus are available for order today (current orders shipping in 4-6 weeks). To view all of Griffin's new iPhone 6 accessories, visit griffintechnology.com/iphone-6.